Lydia Singer- Director for Hope Mountain Vaulters and Head Lounger for Thursday Saturday Intermediate Trot/Canter classes. I was raised in Glide, Oregon riding my grandmothers’ Arabian horses, and any other horse that came my way. I trained and competed in Dressage, English, Western pleasure and trail with my local 4-H club. I was also involved in the USDF Jr. Young Riders program. Horses have always been my passion and drive in life. It followed me to Central Oregon when I moved here in 1999 to attend the COCC massage therapy program. I have had the opportunity to work as a wrangler at Rock Springs Guest Ranch, manage a small private horse ranch where I learned a lot about Polo, and work as a groom at Elevate Sport Horses. Over the years I was given the opportunity to work for and train with talented Dressage trainers such as Racheal Van den Burg, and Diane Van den Burg. I am thrilled and delighted to be a part of the growing vaulting community here in Central Oregon and have 2 daughters who are passionate vaulters. Thanks to Ruthann’s training and mentoring I have found a new passion in training and lunging our club vaulting horses. I am thankful that the beautiful sport of vaulting has found a home in our lives and look forward to seeing it grow in our community. I started riding lessons when I was 5 and just happened to be at a farm with a new vaulting program. I joined the team and have loved the sport ever since. I've been practicing vaulting on and off for the last 22 years. When I was young, I was on an A Level Team which allowed me to progress in the sport quickly. In 2002, I moved to Central Oregon and was very lucky to have a mother that was dedicated to helping me keep vaulting. My mother, sister, and I started a team in Bend. We transitioned from being team-oriented vaulters to focusing on individual events. We trained a horse and taught ourselves through visiting other teams, hosting guest coaches, and participating in extensive clinics on lunging, vaulting, and equestrian osteopathy. Our team competed regionally and nationally for 4 years. My vaulting experience has been a bit DIY and made me learn how to coach and train a vaulting horse. This instilled in me a strong interest in human and equestrian biomechanics, and desire to know how and why to train for vaulting. In the past 2 years, I’ve been practicing Acroyoga and learning more about proper acrobatic form. I’m very excited to share my passion and knowledge with Hope Mountain vaulters! I grew up in Eugene, OR riding and showing welsh ponies, around 16 I started training unbroke horses, showing hunter/jumpers and dressage. 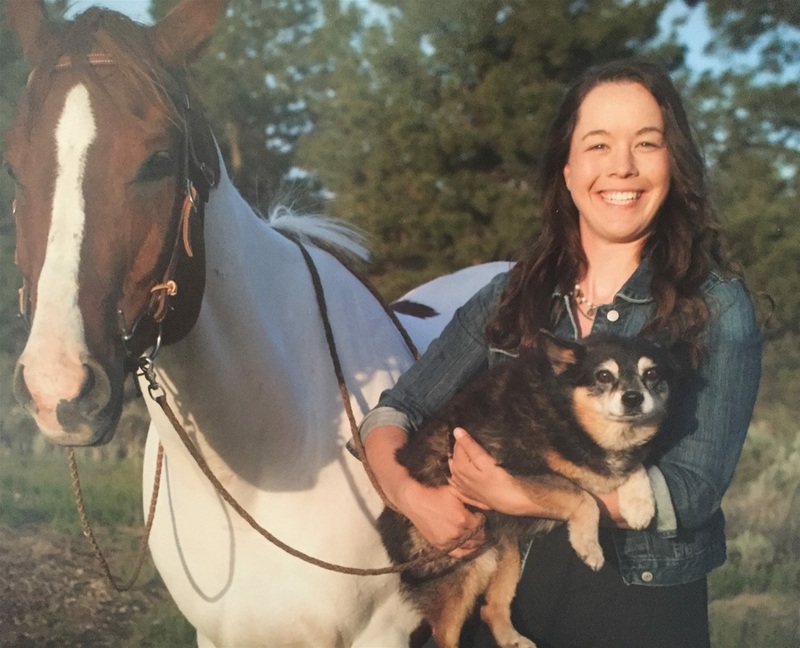 Through college, I taught riding lessons to both youth and adults, coached dressage for high school equestrian team,instructed at Eugene pony club (a local club that covered the basics of western riding and gaming events) and worked as a Equine vet tech for Epona Sport horse. After graduating for college I worked in several supervisory positions at the Children's Farm Home (a psychiatric residential center for youth) including their therapeutic riding program. The 5 years before I had my 3 girls I managed a boarding barn, along with starting and growing a riding lesson program. I have always loved teaching and sharing my love for horses with others. Now that my girls are a little older and have developed a strong love for vaulting I look forward to coaching, learning and hosting Hope Mountain Vaulters at my home. I'm excited to get to know each vaulter, watch them grow as vaulters and progress toward their goals. With the mentorship of Ruthann Steer I have confidence that Hope Mountain Vaulters will continue to provide a safe, fun, exciting learning environment through weekly classes, monthly clinics, and competitions. I grew up extremely passionate for any and all sports that involved performance and gymnastics. I competed in gymnastics for multiple years before becoming part of a performance team which combined gymnastics, aerial arts, and equestrian vaulting. During my five years with Defy Gravity Performance I was able to grow my ability to combine artistry and horsemanship. I have coached gymnastics and aerial arts for seven years and find that these sports provide a foundation for the body mechanics and artistry essential to vaulting. For the past four years I have had the pleasure of coaching equestrian vaulting for various teams and levels of kids. I have traveled all around the U.S. to work with world champion vaulters, coaches, and horses, and am currently a Silver level equestrian vaulter. My favorite part of coaching vaulting is having the opportunity to build positive character and strong athletes. My primary career is software, but I've had a lifelong passion for exercise science. I have had access to great coaches and enjoy passing on their knowledge. And am now excited to teach gymnastics to the Vaulting kids of Hope Mountain Vaulters along with my daughter. Competed as gymnast 1989-1993 up to level 7, and continued with regular gymnastic training until 2012. Ballet for 4 years including pointe work. I have an extensive dance training and have trained and performed in classical jazz through grade school and college in addition to some hip hop and ballet too. I was a certified aerobics instructor for a number of years after college. I have also loved horses my whole life and trained in a variety of disciplines from western pleasure to dressage to jumping to working equitation. I've worked as a wrangler in the Sierra Nevada mountains for a few years from high school to college and still loves to be on the trail with her horses as much as possible. I even did vaulting as a kid at camp and feel lucky to return to the sport with my daughter Evelynne. Evelynne and I will attend the AVA conference in March 2019 to continue building our knowledge of the sport and skills in coaching for Hope Mountain Vaulters. My name is Ruthann Steere and I have over 25 years of GYMNASTICS and HORSE EXPERIENCE combined. I am a certified CHA Vaulting instructor and have earned my Silver Medal with the American Vaulting Association, and over fourteen years experience in both coaching and training gymnasts and equestrians. I am a 2013 Graduate of Asbury University Located in Lexington, KY known as the horse capital of the world, with my Bachelors of Arts Degree in Equine Management and Outdoor Recreation Adventure Leadership. MY passion for people, horses, health and Jesus. I have been a gymnast since the age of two and been riding horses since I was seven. I have also been a horse trainer and instructor since the age of fourteen. I became involved with the sport of vaulting at the age of fifteen and thought what better way to include both my horse and gymnastics experience. After competing at local and national competitions; I started my first club in my home state of MI, coaching and training both horse and vaulters. While at Asbury I had the opportunity of helping to get several clubs up and running all of which are still active and competing, which was my goal as I was only going to be in KY for school. I have had the privilege of training with world champion vaulters from all over the world and competing in both team and individuals at local, regional, national, and international competitions. I love coaching kids of all ages and adults of all ages. I am starting a new vaulting club in the central Oregon area and look forward to meeting you!